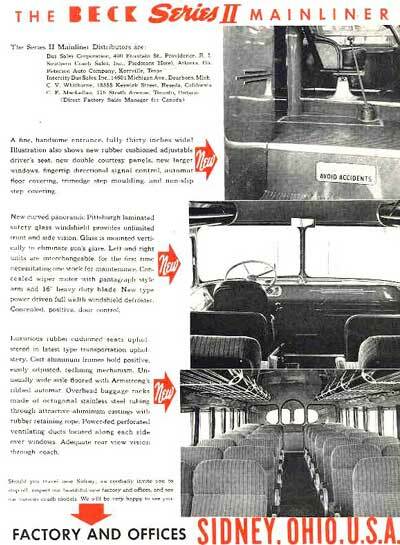 The Southwestern Ohio cities of Fremont, Lima, Loudonville and Sidney were home to a large number of early automobile and motor coach body builders who produced coachwork for many of Ohio’s early automobile, truck and bus manufacturers. Located in Shelby County, the city of Sidney, Ohio was home to most of them and not surprisingly most of the firms were financed and managed by the same group of Sidney businessmen. The firms involved include the Sidney Manufacturing Co., the Commercial Steel Body Co., the Anderson Body Company, the Pioneer Body Company (aka W.P. Anderson Co. ) and the C.D. Beck Co. Most of their plants remain standing today, and they were for the most part situated near the intersection of the Big Four Railroad and Miami Canal, just north of downtown Sidney on the western bank of the Great Miami River. Although most of the early coachwork was for regional manufacturers, by the early twenties short runs of semi-custom coachwork were being produced for Dodge, Hudson, Packard, Studebaker and Willys-Overland (Willys-Knight). By the late twenties bus bodies became their most popular product (on International, Studebaker, Gramm, etc.,) and the only Sidney firm that survived the Depression, C.D. 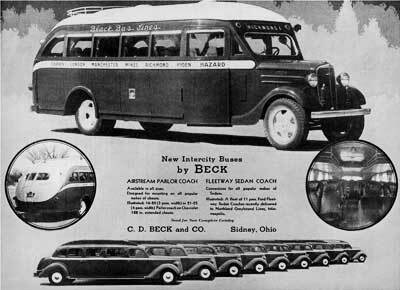 Beck (a reorganization of the Anderson Body Co.) specialized in them, eventually producing their own line of coaches under the C.D. Beck brand name. All of Sidney’s builders can be traced to the city’s prosperous carriage trade, and most of the early history that follows comes from A.B.C. Hitchcock’s ‘History of Shelby County, Ohio,’ pub. 1913 and John Calvin Hover & Joseph Daniel Barnes’ ‘Memoirs of Miami Valley, Vol. I, pub. 1919. One of Sidney Ohio’s pioneer carriage builders was Lawrence Bimel, a native of Germany born in 1827, who in 1833 arrived in America with his parents. The family settled in Wapakoneta, Auglaize County, Ohio where his father served as the community’s tailor. After a rudimentary education Lawrence was apprenticed to a blacksmith and in 1844 relocated to Sidney, Shelby County, Ohio, where he established his own smithworks in which he repaired and manufactured all manner of wagon and carriage. In 1850 he married another German immigrant named Elizabeth Seitz, and on January 27, 1851 their union was blessed with the birth of their first son, William Bimel. During one of Lawrence’s long and tedious trips East to purchased raw materials, the foreman of the Bimel Works loaded up all the tools and material that were movable and drove away with it. The act caused the collapse of the enterprise and in 1857 Lawrence and his young family relocated to St. Mary’s where a promised position awaited him. A second son, Fred, joined the Bimel family on January 8, 1859. His business prospered during the Civil War and in 1868 he erected a large hub and spoke factory in St. Marys. After a public education Lawrence’s 9-year-old son William joined his father in the family business and at the age of 17 was made superintendent of the paint department. In 1872 a disastrous fire destroyed the Bimel Spoke works, but the factory was quickly rebuilt and the manufacture of wagons brought the firm a moderate degree of fame in the region. In 1874 William Bimel was united in marriage to Carrie Bradley, a daughter of Dr. Jacob Bradley, a St. Mary’s physician, and to the blessed union was born three daughters; Gertrude, Emma and Marguerite Bimel. In 1879 Lawrence Bimel established a satellite plant in Portland, Jay County, Indiana for the manufacture of spokes, hubs and felloes which was managed by his son Fred, in the style of L. Bimel & Son. William Bimel served as general superintendent of the Bimel Spoke & Wagon Works, and following his father’s passing in 1888 assumed control of the St. Mary’s enterprise. In 1891, the St. Mary’s carriage works became the property of a stock company, for which William Bimel became general manager. He also established a side-business, the Bimel & Standish Manufacturing Company, which was one of the prosperous industries of St. Mary's. On September 14, 1880 Fred Bimel was united in marriage to Margaret G. Kelsey and to the blessed union was born seven children, five of whom survived to adulthood, those being Carl, Lelia, Hazel, Bernice and Frederick Bimel Jr. The eldest son, Carl Bimel, graduated from the Portland High School after which he studied mechanical engineering at Purdue University which was followed by business classes at the University of Indiana at Valparaiso. Upon Fred Bimel Sr.’s passing on October 2, 1912, Carl Bimel assumed control of the family enterprise, which had recently (1910) been enlarged and modernized so that they could manufacture wheels for automobiles, which soon became their main line of work. In 1897, the Miami Ave. plant of one of Sidney, Ohio’s largest employers, the American Wheel Co. (formerly the Anderson, Frazier & Co.) was destroyed by fire. The firm, which was controlled by the legendary ‘wheel trust’ elected to abandon the operation and the ruins, which covered a large tract of land situated on the north side of the Big Four railroad, from Miami Ave to Main Ave. created an eyesore that attracted the attention of the city’s leading businessmen. The site was originally inhabited by the Anderson-Frazier Wheel Works, a firm founded in 1881 by Enoch Anderson, Cyrus W. Frazier and James N. Anderson. They conducted a large and successful business for over a decade constructing additional structures as business required. In 1893 the partners sold out to the wheel trust, who reorganized it as the American Wheel Co.
A $100,000 bond issue provided the funds to construct a new factory and invitations were sent out to a number of firms in the area advising them of the availability of the city’s new factory and its skilled labor force. Sidney native William Bimel seized the opportunity and re-established his buggy works in a portion of the factory and within a few short months Bimel buggies were once again being made in Sidney, their wheels furnished by his brother Fred in Portland, Indiana. After the 1893 sale of Anderson-Frazier, James N. Anderson purchased and adjacent property, the Maxwell Mill, and commenced the manufacture of carriage wheels under the style of the Anderson Wheel works into 1904 when he retired. His equipment was sold to the Wheel Makers' Association, a sociable trust, who removed it, and the Maxwell Mill property was put up for sale. Shortly thereafter the August 1904 failure of Sidney’s German American Bank, which was heavily invested in the Bimel Buggy works, caused the failure of the latter firm. W.H.C. Goode was appointed receiver of both firms and he set about finding tenants for the underutilized property. Mutual Mfg. Co. produced bodies in-the-white for the region’s numerous carriage builders and is believed to have constructed a few automobile bodies but declining orders caused the failure of the firm within it first couple of years in business. “At a meeting of the stockholders of the Bimel Buggy Co., Sidney, Ohio. August 14th. the following officers were re-elected: G. W. Maxwell, president; I. H. Thedieck. vice-president; T. M. Miller, general manager and treasurer; A. J. Hall, assistant treasurer. The directors chosen were: G. W. Maxwell, T. F. Miller. I. H. Thedieck. A. J. Hall, W. D. Fithian, L. M. Sturtevant, A. C. Nobes, F. E. Miller and A. T. Parke. Another source state it was capitalized at $75,000 and lists the incorporators full names as follows: Ignatius H. Thedieck; Lafayette M. Studevant; Elmer S. Sheets; Augustine A. Gerlach; Paschal P. Dyke; Herbert E. Sheets; Elias J. Griffis; Andrew J. Hess; and William C. Horr. 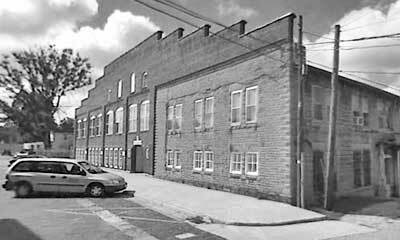 The organization took possession of the vacant Maxwell Mill, which was purchased by Ignatius H. Thedieck for $17,000. As with it successors, the Anderson Body & C.D. 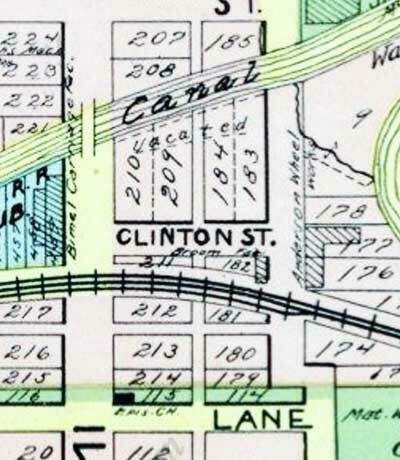 Beck, its plant was located at the corner of Clinton St. and East Ave., in the triangle bordered by the Miami Canal to the north, the Big Four Railroad to the south and the Great Miami River to the East. “The manufacture of steel bodies for commercial automobiles constitutes a field in which there is bound to be an almost unlimited development. The many advantages which the steel body has over bodies made of other materials are so apparent to everyone who takes the trouble to make a comparison that not only builders of motor vehicles at once see the advantages, but the users as well, and customers are demanding them in preference to wood bodies. “The latest addition to the list of steel body makers is the Commercial Steel Body Co., Sidney, Ohio, which has been organized for the manufacture of commercial steel bodies for both motor and horse vehicles. The bodies will be marketed through trade channels. “A full line will be manufactured, ranging from the lightest delivery bodies to those for heavy stake and chain trucks. “The president of the company is P. P. Dyke, who has for years been engaged in the business of building bodies for motor cars and horse-drawn vehicles, a gentleman who is without doubt thoroughly capable of piloting his own concern on a successful course. The company is certainly starting out right under his leadership. The Bimel Buggy Co.’s receiver, William Henry Collier Goode (W.H.C. Goode, b. 1843-d.1923) had created two fortunes for himself – the first in manufacturing steel road scrapers, the second in oil drilling – and hoped to make a third in the automobile business via the reorganized Bimel company. 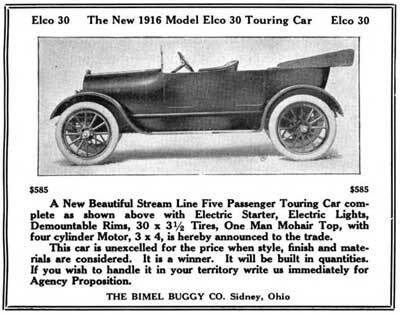 Through a series of events that remain a little hazy, Bimel Buggy obtained the rights to manufacture the Elco 30 automobile from the recently bankrupt Elwood Iron Works, which was located at South J and 22nd Streets in Elwood, Indiana. Originally called the Elco Four, the assembled 4-cylinder, five-seat touring car was to be offered as a lower-priced companion to Baily-Klapp V-8, but the Iron Works’ August 14, 1915 bankruptcy killed both projects. 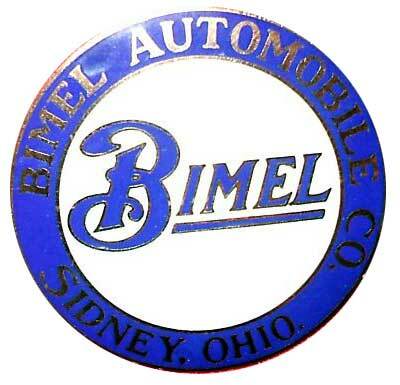 Carl Bimel, William’s brother, and proprietor of the Bimel Spoke and Auto Wheel Co. of Portland, Indiana, was likely involved in the relocation of the Elco project from Elwood to Sidney, although the details are currently unknown. Bimel was most certainly acquainted with W.H.C. 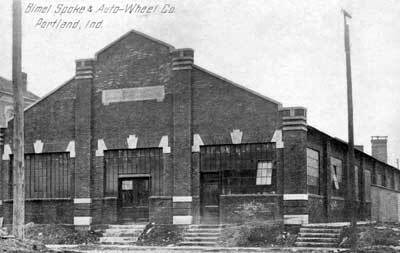 Goode and one possible scenario is that as the supplier of wheels to the Elwood Iron Works, Carl Bimel acquired the rights to the car from the firm’s receiver as the announcement in the March 3, 1915 issue of the Horseless Age, predates Elwood Iron Works bankruptcy sale which occurred on August 15, 1915. The Elco 30’s chief engineer was R.W. Lytle, the firm’s president, Arthur C. Nobel, was an Indianapolis businessman, and its manager, Thomas Milo Miller, was a former partner in Sidney’s Miller & Smith Carriage Co. The firm’s test driver, Sidney resident George Bayley, provided it with some much needed publicity on March 30, 1915 when he was arrested for speeding while taking some out of town visitors on a test drive - the Sidney Daily News reported: "Charged With Exceeding Speed Limit." 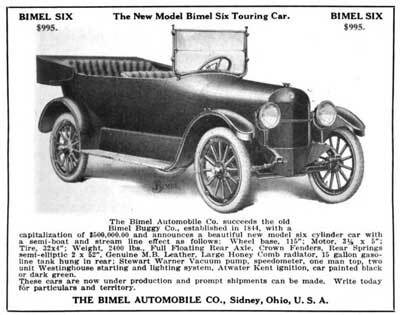 Sales of the popularly-priced car were brisk and a reported 300 Elco 30’s were delivered during 1915, their coachwork being supplied by the neighboring Sidney Manufacturing Co.
“Sidney Ohio, Feb. 21—The Bimel Buggy Co. has reincorporated as the Bimel Automobile Co., increasing its capital to $500,000. The buggy company was established in 1844. The present company took charge of the plant in this city in 1906. 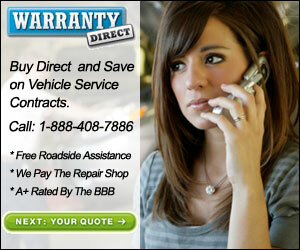 “The company has closed out its vehicle line and will concentrate on four- and six-cylinder cars. The four has been built during the last year for $585. Miller’s trial was held during December of 1917, and many of the firm’s executives were called to testify during the two-week-long trial. The jury believed the testimony of the swindled townsfolk, many of whom invested a large portion of their savings in the firm and Miller was found guilty. The Judge sentenced him to a three-year prison term, but his sentence was immediately commuted at the sentencing. The remaining officers of the firm were never charged, but the disgraced former carriage-builder wisely decided to leave town. The bankruptcy proceedings did not involve the Bimel factory which was being leased by the firm, and its directors were largely unaffected by the failure. Most were invested in the Sidney Manufacturing Company which did a brisk business during the war working on numerous small contracts for the US Military. Post-War products included wooden steering wheels, automobile bodies, and associated parts but by 1922 the post-war Depression had placed the firm into receivership. Sidney Manufacturing Co.’s assets were purchased at auction by a group of Sidney businessmen – many of whom had connections to the bankrupt firm, and on October 24, 1923 the Sidney Daily News reported: "New Manufacturing Plant Organized." The Anderson Body Company was the name of the new firm, and its incorporators included Lafayette M. Studevant, A. J. Hess, E. J. Griffis, William P. Anderson and Frank Thedieck (son of Ignatious H. Thedieck). Although the Anderson name was well-known to Sidney’s residents, its manager and namesake, William P. Anderson, was not a local son, but a hired gun, brought in due to his vast experience in all phases of the automobile industry. Dayton Screw Products, Second & Webb Streets, Dayton, Ohio failed in late 1917 and on February 1, 1918 was reorganized as the Dayton Automatic Products Co., with G.C. Hodson as president. Kramer had accepted a position with the Rochester Motors Co. as president. Within the year he had taken a position as vice-president of Buffalo, New York’s Pierce Arrow Co. It’s possible William P. Anderson was working for Kramer at the time, however his exact whereabouts during 1921 and 1922 are currently unknown. 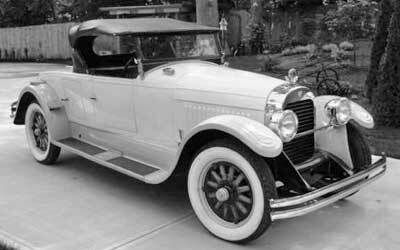 He next appears on the automotive radar in 1923 as vice-president of Sidney, Ohio’s Anderson Body Company. 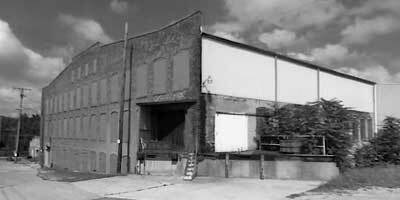 The recently organized firm moved into the Maxwell Mill complex on the west bank of the Great Miami River at the corner of East Avenue and Clinton Street and hired many of the workers recently displaced by the failures of the Mutual Mfg. and Sidney Mfg. Companies. The firm specialized in closed bodies, and their coupes were especially attractive. W.P. 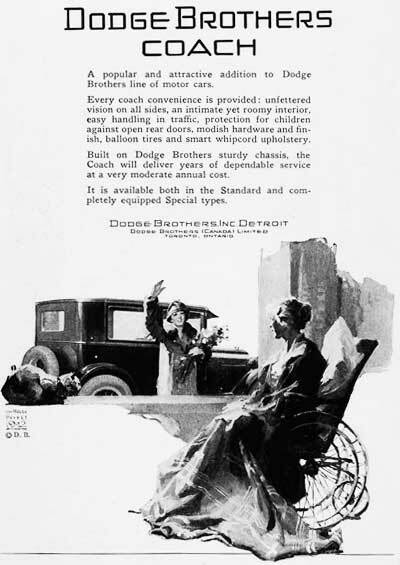 Anderson’s automotive connections proved valuable and within six weeks of its organization he had secured an order for hundreds of brougham bodies from Dodge Brothers. Sales were so brisk that a second shift was added in late 1923. 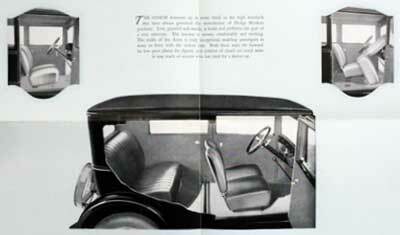 The firm’s 4-door brougham body was exhibited at the 1924 New York and Chicago automobile shows the Sidney Daily News describing it as: “The best designed four-passenger four-door brougham car at either show." Small numbers of commercial bodies were constructed during the mid-to late 1920s and Anderson Body is known to have built a few funeral car and ambulance bodies for regional customers. Sidney was visited by a tornado at 3:30 p.m. on July 25, 1925 that tore the roof off a portion of the Anderson Body Co. factory and knocked down a chimney. Luckily the plant was empty as the staff had only worked a half-day, and production was unaffected. “Five demonstrations - of the last word in auto busses, as manufactured by the Studebaker company, passed through Uniontown Monday morning on the way to Atlantic City, where they will be displayed and demonstrated at the Electric Railroad convention. 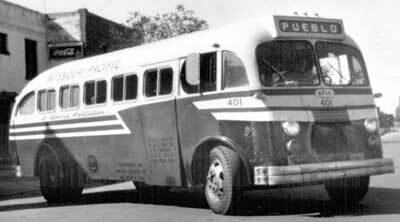 The busses attracted unusual attention as they stood on the streets of the city a short time. 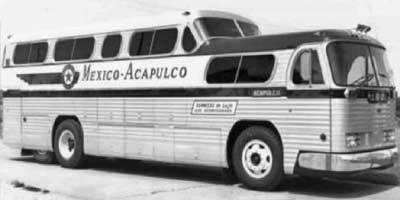 “In the collection were a 21 passenger street car bus, 15 passenger chair car, 13 passenger sedan, 15 passenger parlor car and a pay as you enter type. The busses, In charge of George A. Wolf, left South Bend, Ind., Saturday morning and made about an average of 35 miles per hour. 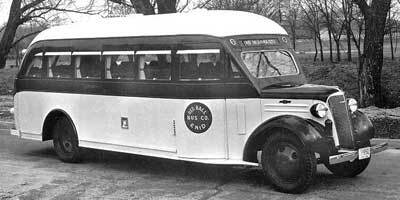 Mr. Wolf reports that -when they left the factory the company was 100 busses behind the orders filed. “One of the most striking jobs seen in Billings in many months was delivered last week by the Overland-Mulvaney company to Ted Krubuick of Anaconda. Mr. Krubuick received his car here and drove it home. “The car-was a custom-built seven-passenger body of rare beauty, mounted on a Willys-Knight six chassis. It attracted considerable attention at the show rooms of the company on North twenty-seventh street where it was unloaded, and Mr. Krubuick was envied by a score or more of Willys-Knight enthusiasts who were given a ‘slant’ at the car before he drove it home. 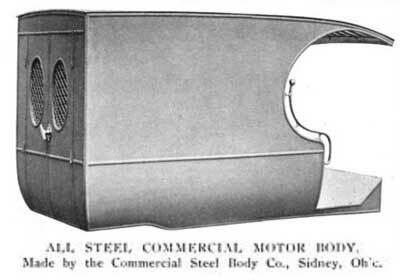 “The body-was built by the Anderson Body company of Sidney, Ohio. It is longer and roomier than the stock sedan, although it conforms in body lines, to the stock models. The body is the last word in appointments and it is rich in fittings. Upholstery is of silk mohair, and the interior hardware of sterling silver. The paint job is three-tone Duco, conforming in general to the color scheme of the stock sedan, but made distinctive by use of Duco and an added tone. The firm’s composite bodies were built by hand and peak production of the firm was ten car bodies a day. 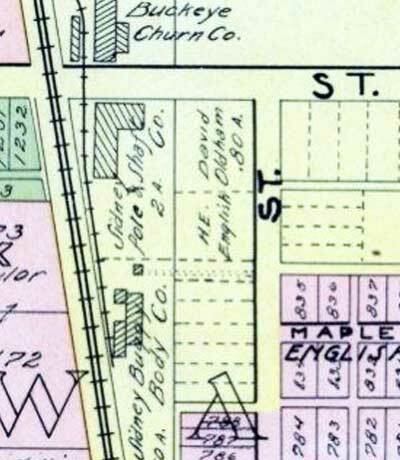 Sidney Ohio’s Pioneer Body Co. was unrelated to the Pioneer Body Co. of Camden, New Jersey, (405-409 Mickle St.) which was active at much the same time. Sidney’s Pioneer constructed both open and closed coachwork, one surviving Pioneer-built 1927 Hudson Roadster with RHD features a golf bag compartment and a pair of unusual parking lights mounted high on the cowl, two features found on another surviving Pioneer-bodied Hudson, a LHD 1926 Hudson Coupe which was also fitted at the Pioneer factory with an exceptionally long built-in sun visor that extends 6’ or more in front of the windshield. Pioneer specialized in semi-custom bodies and in addition to the aforementioned Hudsons, also produced a similar line of bodies for Studebaker that were equipped with a golf bag compartment on the passenger side of the car. An advertisement for the Eqyptian Lacquer Mfg. Co. which appeared in the August 1926 issue of Motor also included a picture of the three Pioneer-bodied Hudsons, a coupe, a convertible coupe, and a Victoria. (Pioneer’s directors included William P. Anderson, William Quinn, James J. Sarver, Merrill Bruce McKee and Wilson P. Kraft). “After two years of intensive experimental work, Motor Products Corporation, Detroit, Michigan, has developed a new type of wind- shield, in which is incorporated a number of improvements which afford marked advantages over the conventional swing arm type wind-shield. It has already been adopted by Dietrich, Inc. in its custom built bodies, by the Auburn Automobile Company on all models, by Pioneer Body Company, manufacturers of special bodies for Hudson and Dodge cars, and sample installations are being made by eighteen other car manufacturers and body builders. “The shield, which is known as the Mono-Control Windshield due to its one-hand control, can be operated while the car is in motion. With the swing arm type shield it is necessary for the driver to stop the car to adjust the windshield and as a consequence his in inclined to drive the car with the windshield closed even when it is at the expense of his own comfort. With the Mono Control Windshield, the shield may be opened or closed with one hand almost instantly. The mechanism is positive, self-locking in any position. “The shield is of the swinging type. It is not hinged at the top as in general practice, but is swung at either end of the top cross member on steel trunions which engage in bronze bushings set in the corner posts. This construction materially simplifies installation. The shield is simply set in place, the trunions slipped into the bushings and locked with clamp screws, and the flange of the mechanism bolted to the header. “The operating mechanism is of an ingenious worm and gear construction with spring adjustments to compensate automatically for radial play, end-thrust and wear. It is completely enclosed in an inconspicuous die cast housing, packed with special grease, which will not melt under 200 degrees, nor freeze at 10 degrees below zero, and which will not cake or harden. It operates by means of a small crank handle set at a convenient angle which may be located at any point along the top cross member. “Eight revolutions of the handle raise the shield from a closed position to a sixty degree opening. This provides for full vision and is the only one piece shield in which this is possible. A patented seal on the side and bottom cross members of the frame insure a perfect weather tight fit. A stream of water may be turned against the shield without it leaking. “The frame, welded at the lower corners, is held together by telescoping screws at the upper corners which are reinforced by steel angle bars. The construction makes it unnecessary to remove the windshield for reglazing, while the steel bars which engage in a close fit in the top cross member give the shield the necessary strength and rigidity. “The elimination of the swing arm sectors give the shield an unusual clean-cut, finished appearance, but what is of greater pertinence, a flexibility which serves to absorb shocks. This reduces the possibility of glass breakage to a minimum for, with the removal of the swing arms, the shield is no longer held rigid at the two opposite joints, but allowed to give sufficiently to dissipate the forces set up. There are no bolts, mils, or thumb screws on this shield to work loose or become lost. The shield is rattle-proof in either open or closed position. The construction of the shield permits a small corner post, one of the features which distinguish contemporary body design. “When wide open the shield allows the very greatest possible ventilation and it must be at once apparent that it provides adequate ventilation without direct draft. As a matter of fact, a car can be driven in a rain storm with this shield partly open without admitting water. “Sidney, Feb. 10.—Hugh L. Wilson, cashier of the Citizens National Bank, was appointed as receiver for the Pioneer Body company by Judge Barnes in common pleas court Tuesday afternoon. Bond was fixed at $5,000. 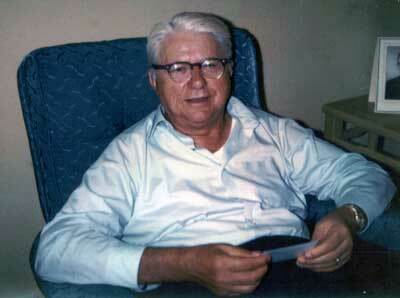 George Philler, W.A. Ross and E. T. Wright were appointed appraisers. “As the result of a business deal consummated last week between the Anderson Body company of Sidney and H.H. 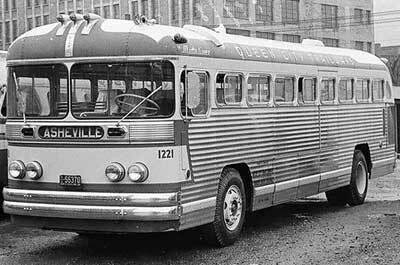 Young, bus body manufacturer of Loudonvllle, it is expected that operations will begin soon in Sidney in the manufacture of bus bodies. Mr. Young leased the Anderson Body company factory where the work will be carried on in connection with a plant owned by Mr. Young in Loudonville. In 1913 Hugo H. Young and Carl F. Dudte founded the Flexible Sidecar Co., in Loudonville, Ohio. It changed to Flxible in 1919 when they discovered the ‘Flexible’ moniker was already a registered trademark. 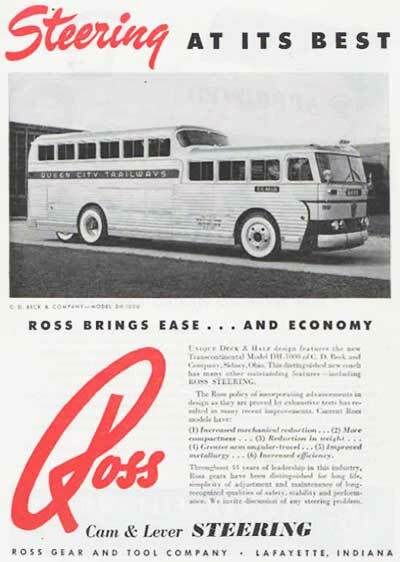 Young served as Flxible’s vice-president, treasurer and general manager and pioneered the firm’s transformation into one of the nation’s largest bus body builders during the mid-to-late 1920s. Young new better than most that the success of a firm ultimately depended on the sale of its merchandise and the selection of Clayton D. Beck (b. Feb. 11, 1906-d.June 3, 1984) a well-known and respected bus body salesman to head the sales and advertising department of his Sidney operation was a wise one. Clayton Dale* Beck was born on February 11, 1906 to Ira R. (b.1866) and Lillie Ann (Wright-b.1868) Beck in Riley, Sandusky County, Ohio. His siblings included Lloyd W. (b.1892), Lulu M. (b.1894), Roland I. (b.1896), Nora (b. 1898) and Frank (b.1901) – Clayton being the youngest. He attended the public schools in Fremont, Sandusky County, Ohio, and found employment with the Fremont Metal Body Co. as a salesman. Clayton D. Beck (b. Feb. 11, 1906) married Kathryn Marie (b. Feb. 2, 1910, in Clyde, Ohio to Frank and Mary Gertrude [Shanahan] Bruggeman-d. Sep. 16, 2009) on June 9, 1927 and to the blessed union were born two sons, Richard C. (b.1928-d.2011) James F. (b.1932-d.1996) Beck. 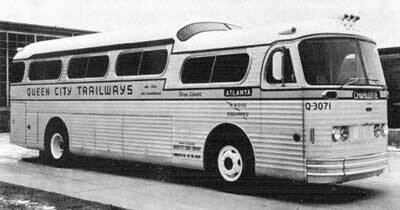 The Economy line consisted of a line of low-cost intercity and transit coach bodies with seating capacities from 12 to 33 passengers mated to a stretched Chevrolet or Ford commercial chassis. An almost identical line was introduced by Flxible at about the same time, but sales were disappointing and Hugo H. Young abandoned the Sidney bus-building operation and returned home to concentrate on his mounting problems at Flxible. Anderson Body’s directors reorganized the firm with Clayton D. Beck at the helm, and C.D. 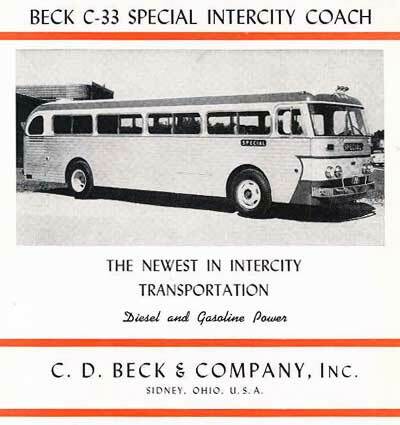 Beck & Company commenced operations in 1934. 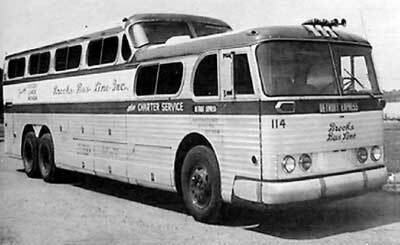 Early on the firm abandoned its school and transit coach business and concentrated on intercity coaches with seating capacities from 12 to 33 passengers, many of which were mounted on lengthened Ford Model BB chassis. 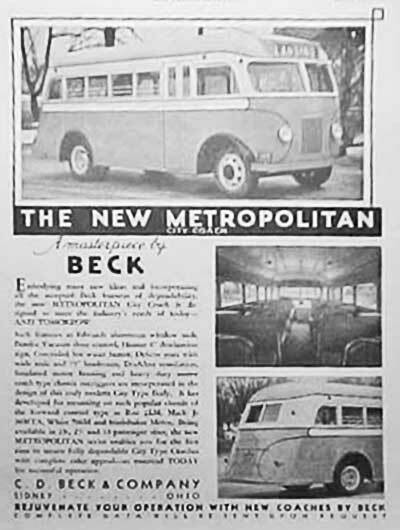 The Beck name was first used in connection with the ‘Fleetway’, an 11-passenger sedan-based coach built on stretched automobile chassis. 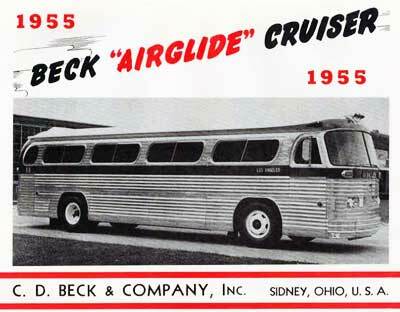 The Beck Airstream, a medium-capacity intercity coach debuted shortly thereafter which featured an aerodynamic body mounted on top of a 188” Ford chassis – a full 31 inches longer than Ford's 157" frame. 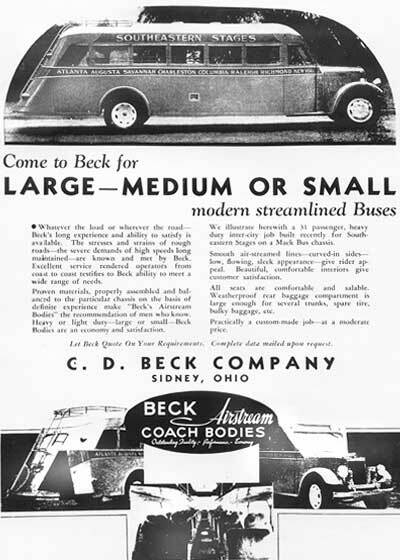 The firm’s first all-steel body, the ‘Steel­iner,’ debuted in 1937, and remained Beck's most popular pro­duct into the Second World War. 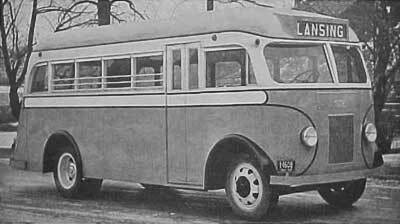 Integral body/frame construction (monocoque) followed shortly thereafter and both body-on­-chassis and ‘integral’ motor coaches were offered into 1939, after which the firm offered monocoque coaches exclusively. 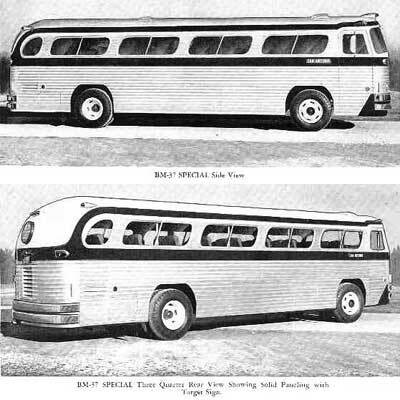 The rear-engined Super Steeliner appeared in 1938 as a lower-priced alternative to Yellow’s Super Coach, but failed to make a dent in the marketplace, which was increasingly being dominated by General Motors products. 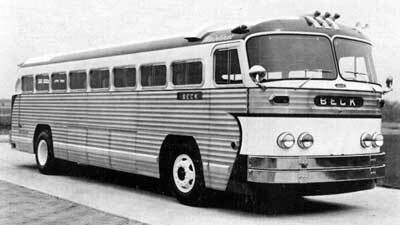 The Super Steeliner was superseded by the rear-en­gined, 33-passenger Mainliner and Luxuryliner in 1940. 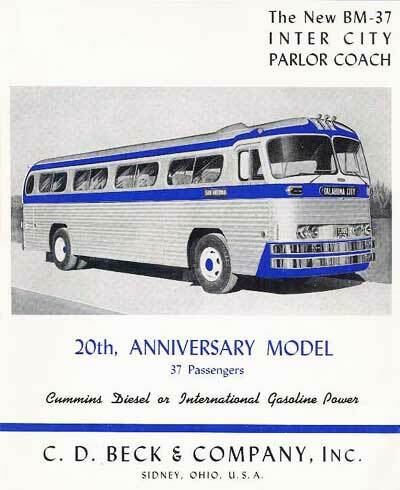 Available with a choice of 185- or 220-inch wheelbases, the International-powered coaches hoped to compete against similar offerings from Aerocoach, Fitzjohn and Flxible. The poor layout and antiquated machinery of Beck’s Century-old factory prohibited the firm from getting any lucrative US Military contracts during the War, and the situation was rectified when an all-new factory was constructed at the southeast intersection of North Main Ave. and Russel Rd. in 1946. 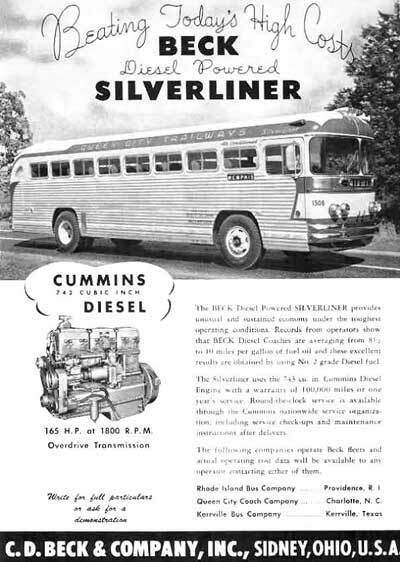 Production of the Pre-War Mainliner and Steeliner coaches were continued in to 1948 when they were replaced by an all-new tube-framed series of coaches coach designed by chief engineer Donald Manning. 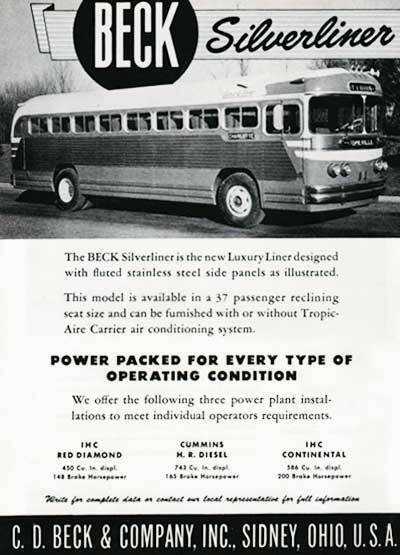 Beck survived the early 1950s by producing budget-priced intercity coaches that emulated the offerings of their higher-priced competitors, Flxible and General Motors. 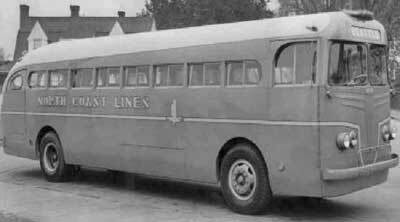 GM was especially hard to compete against as many independent Trailways and Greyhound operators were required to buy from the General. 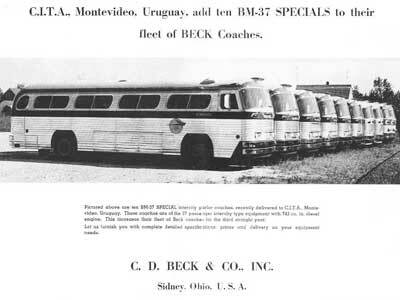 Domestic sales were soon overshadowed by the firm’s exports, and Beck Coaches proved popular with surface transit and railway operators in the Caribbean and Central and South America, especially in Cuba and Mexico. 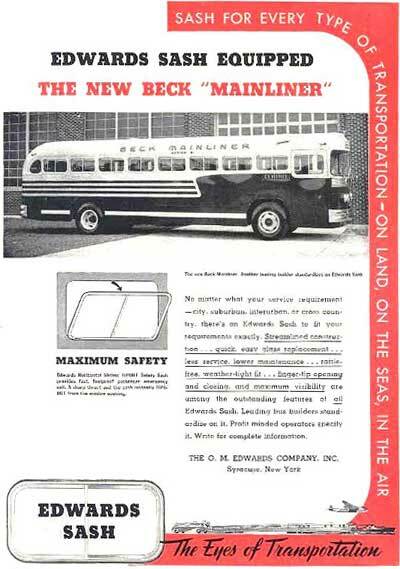 Beck introduced a number of models with fluted stainless steel paneling which were indistinguishable from GM’s products from a distance and gave purchasers a choice of gasoline or diesel power, air-conditioning and even air suspension. Its 9600 series closely resembled the General’s Scenicruiser and its deck-and-a-half model DH1000 the Setra Golden and Silver Eagles. 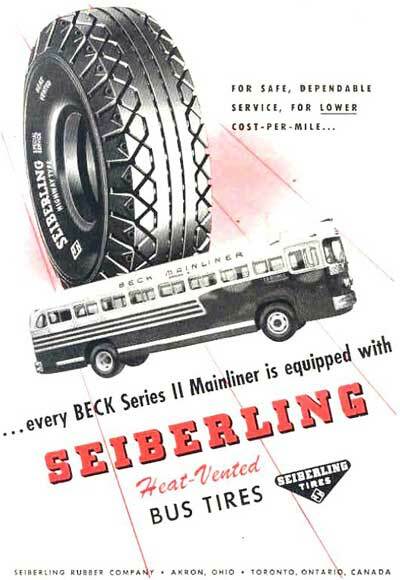 In 1954 Beck began constructing Ahrens-Fox Fire Apparatus for the firm’s Cincinnati-based owners Walter & Duke Walkenhorst. 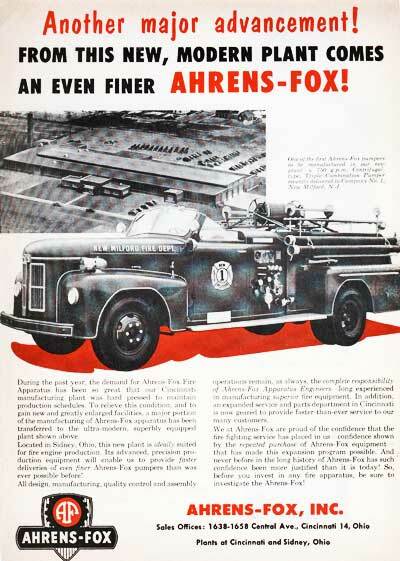 Control of Ahrens-Fox was subsequently transferred to former A-F engineer, Richard C. Nepper who continued the arrangement into 1956 when Beck acquired the rights to the Ahrens-Fox name and introduced the all-new cab-forward Ahrens-Fox Model FCB pumper. “A NEW BUS MANUFACTURING GIANT was created last month with the announcement that Mack Trucks, Inc., has purchased the intercity bus manufacturing firm of C. D. Beck & Co. Long restricting its bus manufacturing to local transit-type buses, Mack embarked on this venture, said President P. O. Peterson, to be able to “Compete for additional bus travel business” sure to come with the advent of the superhighway and toll roads. “No sooner was news of the purchase announced than Greyhound, one of the largest customers for intercity buses, let it be known at the convention of the National Association of Motor Bus Operators that it had ordered 34 new buses from Mack. Beck, one of the smaller manufacturing firms which pioneered many of the innovations that have since become standard, will be operated as a division of Mack. 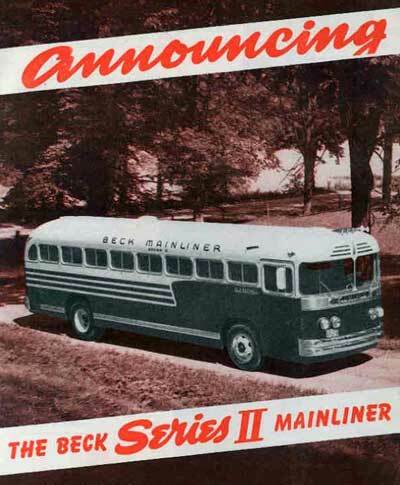 “Peterson said that Mack will begin producing intercity buses immediately through the facilities of the Beck plant at Sidney, Ohio. However the 34 vehicles ordered by Greyhound will not be intercity vehicles, but will be Mack C-59 models, transit-type buses costing $23,019 each. “However, Greyhound is currently preparing a "multi-million dollar suit against GM for alleged failures in Scenicruiser buses." 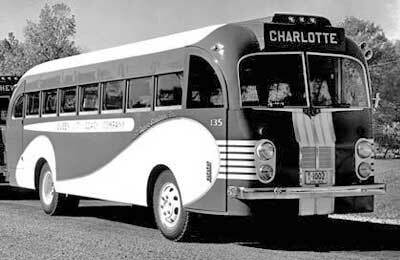 In addition to the bus manufacturing facilities of the Beck company, Mack also acquired the C.D. Beck Realty Co., and also a large plot of land adjacent to the Beck Plant. The latter purchase, said Peterson, will permit future expansion of facilities. In hindsight Mack’s decision to acquire the Beck facility was not a good one, and after a single produc­tion run of 25 Mack Cruisers and 12 Mack Model C forward control pumpers (the renamed Ahrens-Fox FCB) were constructed, they closed down the plant, and relocated production of the Mack Model C fire truck to Allentown, Pennsylvania. Ironically the Ahrens-Fox FCB derived Mack Model C proved to be one of their most successful fire apparatus platforms and remained in production into 1967. Total production of C.D. 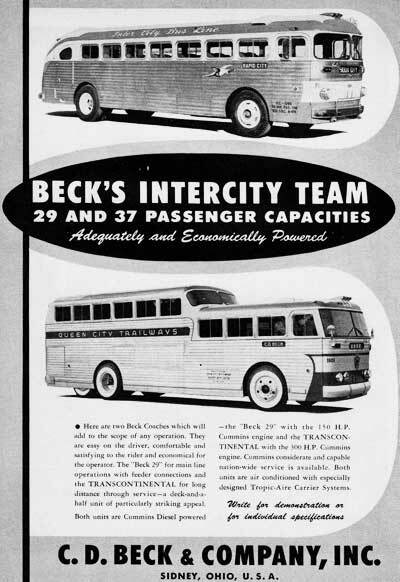 Beck & Co. buses is estimated at 3150 units and a breakdown of its postwar units follows in Appendix A. 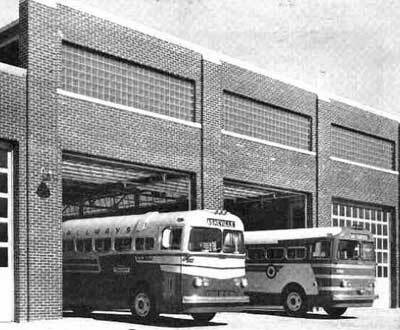 In 1963, Mack sold off the mostly-vacant former C.D. 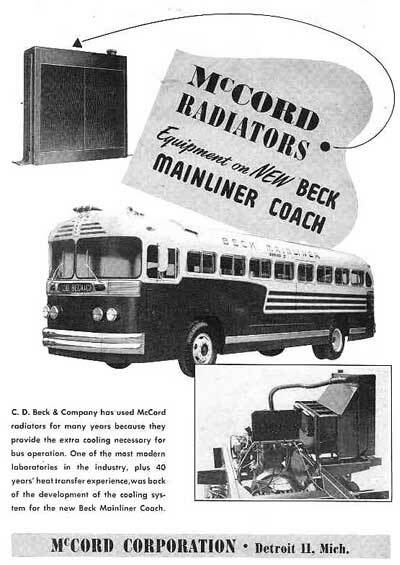 Beck bus plant to LeRoi, who commenced the manufacture of their successful line of industrial and trailer-mounted air compressors. They’re still in business and remain one of Sidney’s largest employers. Clayton D. Beck’ activities after the closing of his bus plant are currently unknown however I discovered he passed away on June 3, 1984 at the age of 78.